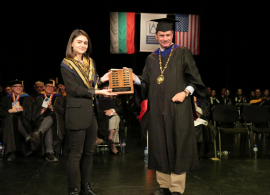 AUBG’s 2019 Presidential Medalist is Nicoleta Paladi—a student from Moldova who has demonstrated outstanding academic potential, great involvement with extracurricular activities and a strong commitment to social responsibility. A Political Science and International Relations and European Studies student, Paladi has built an online platform for the empowerment of young women and girls. She has also co-created an English language mentorship program for Moldovan youth and has been a driving force in the establishment of a Moldovan-American Foundation in support of orphaned children. 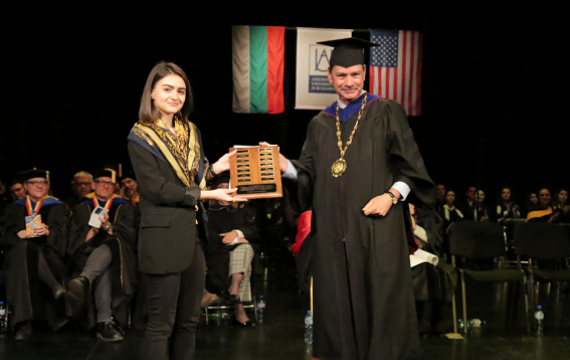 Paladi received AUBG’s highest academic award during the 26th Honors Convocation in Dr. Carl Djerassi Theater Hall Apr. 10. An annual celebration of academic excellence, the ceremony aims to recognize the many successes of the graduating students at AUBG. 51 students in total were recognized for their achievements both in and out of the classroom.